Climbing Mera peak is a truly amazing climbing experience at the end of the Hinku valley. Ian has climbed Everest to the top and led 6 Mera peak expeditions and with 5 climbs ending up on the summit. We have run over 55 Mera peak expeditions and have and overall 85% success rate on our climbs. We think the views off Mera peak are some of the best and unique mountain views in the world. Mera peak has 3 summits and the highest is our objective at 6,476m/ 21,246 feet. Watch our Mera peak video, check out our 2019 dates and CONTACT US today. Check out our unique itinerary below. Check out our Top 10 Tips or a successful Mera peak climb. This valley has remained untouched for centuries, with high peaks standing in all directions. This trek along with the climb of Mera Peak holds some of the world’s most spectacular mountain views and serene valleys. You will see 5 out of 6 of the world’s highest mountains on this trip. Our Mera peak climbs have an excellent tried and tested acclimatization program which has given us 85% success to date. CLICK HERE for upcoming trips. The two keys to success climbing Mera peak are coming with excellent physical strength and conditioning and having enough time for acclimatization. We have the right schedule and we can help you get the right training for your Mera peak climb. The cost start from USD $4,200. We get off the beaten Mera Peak trail, crossing the Hinku valley and camping in rarely visited villages and camp sites, spending time high above the main trail, gathering extra acclimatization and conditioning surrounded by stunning scenery and unique valleys. The journey up to Mera Peak is such a rewarding trek, frozen lakes, hanging glaciers, very few people ever see and views you will never forget. 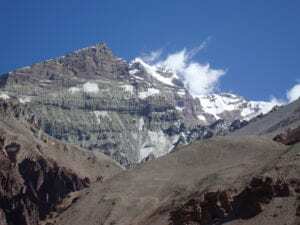 We have three or four nights sleeping above 4,900m/ 16,076ft before moving to base camp 5,350m/ 17,552 feet onto Mera Peak high camp at 5,800m/ 19,028ft and hopefully to the summit at 6,476m/ 21,246ft. Our goal is to get you safely to the summit and back down to khare in one day. With our acclimatization schedule you have the best chance at making the summit of Mera peak as we have additional days built in for summit attempts. Read some REVIEWS from our trips. We believe excellent acclimatization and physical conditioning are the keys to success in the mountains. We are available 5 days a week in support of your climb and want to help you get up to speed so you can fully enjoy your Mera Peak expedition. We want you to call and e-mail any questions you may have. We can help you with training advice, clothing and gear selection and answer all your questions aiding you as you prepare for this adventure adventure and climb on Mera Peak. Read more Mera Peak REVIEWS. Fly to Kathmandu, arriving the morning or afternoon before the trek. You will be meet by an Ian Taylor Trekking representative and brought to your 3 star hotel in Kathmandu. You will be able to pick up any last minute items along with exploring the streets of Kathmandu by night. We will have our guide check your gear to make sure you have everything needed for the climb of Mera Peak. From Poyan, we will follow the route south over a river and traverse around the side of the hill and drop down into Khare Khola before turning east and gradually up hill to the town of Pangkongma 2,846m/9,337ft We will camp next to a cluster of lodges and local Sherpa homes. We will take a stroll up to the monastery which has recently rebuilt. We might be lucky enough to be invited into some of the locals homes and see how the locals live in these Himalayan foot hills. We will retract our steps up passed the small monastery and through the Rhododendron forest on a steep winding stairs up to the Pangkongma la 3,174m/ 10,413ft From here we will follow the ridge line on a long descent down over 1,000m/ 3,281ft to our lunch spot beside the Hinku Khola river. We will then climb up 600m/ 1,969ft to the stunning campsite of Nashing Dingma at 2,600m/ 8,530ft. We will be up again early at 7am and start hiking gradually up through beautiful green fields before a steep stair case up before topping out on the Surka La. As we reach the top with a couple of lodges selling snacks. We cut around the back of the lodge through a forest, fir trees and rhododendron trees. We then move onto a rocky path and back up on rocky stairs to a wide open camp site at Chalem Kharka 3,600m/ 11,811ft. We will be off again on a long ascent up to our high point of 4,500m/ 14,764ft. We walk out the back of our campsite on a gradual slope and we emerge out into a rocky and baron landscape. This is a beautiful hike and we can some times reach the snow line and snow scattered across the hills. After the initial 45 minutes out of camp you can see the rocky stair case up ahead and this is a long grind up for a few hours. We will stop at the top for lunch and it can be cold so make sure you have your down jacket. We will gradually descend over rugged, rocky terrain. We will pass a couple of lakes in a beautiful mountain setting before dropping down into a serene mountain valley where we will camp at Chunbu Kharka 4,200m/ 13,779ft. Today we will descend down into Khote 3,600m/ 11,811ft. after 20 minutes of up hill walking we get great view looking back from the Panch Pokhari view point. From here we contour around the and down high above the Hinku valley. We follow the rocky path down hill which leads us back into the tree line. We continue further through the forest and come out at the valley floor. We head north cutting in and out of the forest up and down before coming to a small wooden bridge which takes 35 minutes and arriving in Khote for the night. This a beautiful setting and one to be remembered. After a good nights sleep we have a nice trek to Tangnag 4,360m/ 14,304ft. The first hour is a beautiful walk with giant mountains in all directions. We then stay on the left hand side of the river, watching out for rock fall on our left. The trail and terrain is gradual mixed rock and pastures where yaks graze in the summer months. Tangnag is growing all the time and we will camp in this beautiful mountain setting. You can sit in a lodge and warm up with a nice fire in the evening. If the team are feeling well we will move to Khare 5,100m/ 16,732ft. today. We may take the opportunity to stay in Dig Kharka 4,650m/ 15,256ft. if needed. The route turns to the east as we trek through the valley floor and slowly make our way past stunning high altitude peaks, Black Mera is a spectacular mountain rising right out of the valley, we pass amazing lakes, glaciers, in one of the great Himalayan valleys. We will hopefully arrive in Khare after lunch and relax for the rest of the day. We will spend the day in Khare 5,100m/ 16,732ft. We will do an acclimatization trek up to 5,300m/ 17364ft. on a stunning hill just outside of town giving everyone a chance to view into a beautiful glaciated valley to the north and be inspired by the sheer size of Mera peak and the glacier that rolls off the mountain. Khare is developing fast and has some nice lodges to relax and enjoy a warm fire. Today is another acclimatization and rest day. We will spend the morning getting our climbing gear sorted. We will rig up a climbing scenario and practice using crampons, Jumars, abseiling and we will practice until you are comfortable doing all the different techniques. We will rest up and enjoy this amazing mountain setting. Today we will make the move from Khare to Mera Base Camp 5,300m/ 17,388ft. today we climb up to the Mera La 5,400m/ 17,717ft. We will climb up to the Mera Glacier. At first it is easy but the trek up to the glacier is steep in sections and you will need to pace yourself and make sure you are getting your foot placements correctly. There is a chance of rock fall so wearing helmets, crampons is needed. The walk across the glacier is outstanding, with views and memories you will never forget. The descent from the glacier to the campsite is short. We walk between the moraine and the glacier on the northern side as it descends from the col down to the campsite which you can easily see from the glacier. We will ascend to Mera High Camp 5,800m/ 19,029ft. We head back onto the glacier to where we dropped off yesterday and follow the easy graded snow slopes, and after a short distance arrive at an area of crevasses which we will have to navigate carefully. We then make are way slowly up to High camp. Remember to look behind you where you will see views of Everest, Makalu, Nuptse and Lhotse and this trek up to high camp holds some Himalayan treasures. This camp is hidden behind a rocky section. The camp site is small and has some drop offs on the right as you enter the camp. It is time to rehydrate and recover for summit push. The climb to the summit of Mera Peak starts gradually, and much depends on weather conditions. Once we leave high camp usually at 2am it should take 5/6 hours to reach the summit. Getting into a rest step and taking our time will be critical to conserving energy for the decent. The central summit appears above the wide glacier, flanked by 2 ridges. We climb the snowfields avoiding the crevasses. This steep section can take 2 hours and is slow going. The route swings to the east of the left hand ridge before turning back towards the main summit ridge of Mera. Mera has 3 summits, our objective is the highest. This short steep snow slope is easily climbed, but the last 30m/98ft requires a lot of effort, Jumaring on a short steep ice section and you arrive on the summit. After reaching the summit and enjoying amazing views over the Himalayas, we have a short abseil before the long descent back to High camp. We will rest for one hour before descending back down to Khare at 5,100m/ 16,732ft. After a good nights sleep we will get up early and make our way back to Khote 3,600m/ 11,811ft. It will take two hours to retract our steps to Tangnag 4,360m/ 14,304ft. and then another 3 hours back to Khote. The route back to Lukla takes us over the shorter route. We cross some ridges making our way to Chhatrabuk 4,300m/ 14,107 feet. Today be move from Chhatrabuk to Chhutanga. This is another long day hiking as we move closer to getting back to Lukla. We This is the easiest and shortest day of the trek. We descend from Chhutanga to Lukla through the dense forest which takes about 3 hours. We will arrive back into Lukla and relax for the rest of the day, before our flight back to Kathmandu early the next day. We will be up early for our morning flight back to Kathmandu, shower change and head out to finish off your Kathmandu sightseeing. You can either fly home this evening or spend another day in Kathmandu. We also cover one nights accommodation in Kathmandu at the end of the trip. Pick up some last minute items, spend the afternoon at the Kathmandu Spa and prepare for your flight home or onward journey. Ian Taylor Trekking are committed to the preparation of all our participants. We are available 5 days a week to take calls, answer e-mails and giving you professional assistance and advise about your chosen climb. We pride ourselves and giving you first hand experience about your chosen adventure. Call us about Mera Peak, training, hikes and taking that next step in your journey.